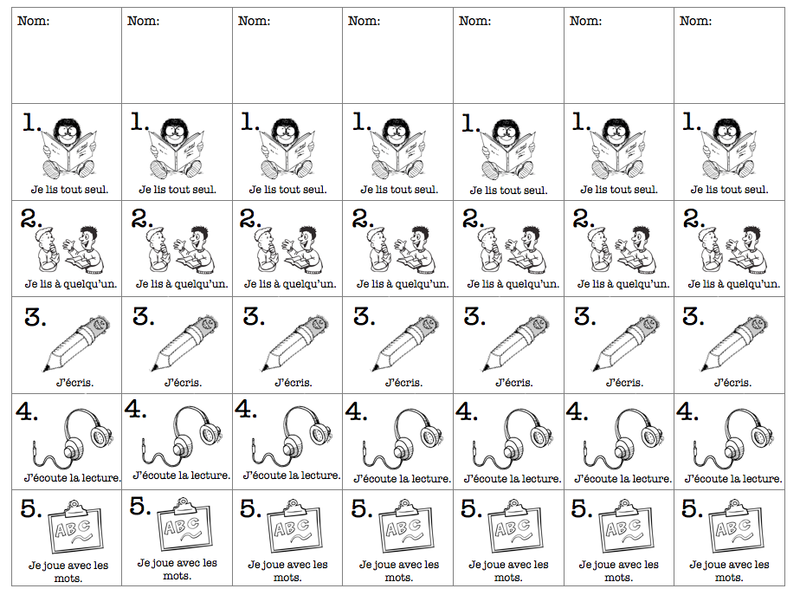 I had a reader ask about whether or not we use The Daily Five in kindergarten and what that looks like in a French Immersion kindergarten class (another post has some of my printable materials here). I have taught kindergarten but have not used the daily 5 in K. The teachers at our school do begin the Daily 5 (somewhat modified) in Kindergarten. In some classes the 5 are added as centres during centre time. Initially they spend 20 minutes at each centre (hopefully 30 by January). Here are my thoughts based on what I've done with grade 1s and what my colleagues have done in kindergarten. The Sisters website and book is always the best place to go back to and review how to implement the Daily Five. 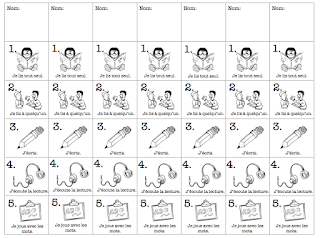 We also have a home-reading program with books and CDs called Oui, oui, oui and use that in classroom too. Lyrics of songs students have learned so far are bound in a book and include images to go with the words when possible. Students use a pointer or magnifying glass to follow along as they sing. They LOVE it that they can 'read' these songs. It really does increase the French sight words they know. Students make collaborative books and finish-me books throughout the year. The class books are kept in the class library and the students like to 'read' these familiar sentences written by one another. The finish-me books stay in their book boxes, they are sent home each term. Examples of the finish-me books we made in grade 1 for our colour unit are here. I haven't posted all of the ones we used for Kindergarten. Most of these I made or modified from english materials. The rest is described here (I may not have them all posted but this will get you started). "Les amis, qu'est-ce que vous n'aimez pas manger? Quel est le repas le plus désagréable pour vous?" I hate broccoli. I do not like cooked carrots. Eww me too. "Ah voilà, Je n'aime pas le broccoli. J'aime les carottes. Je n'aime pas les carottes cuites." Les amis, pouvez-vous répéter avec moi ce que notre amie aime et ce qu'elle n'aime pas?" And we repeat the sentences together, pointing out the foods on a visual or wherever we might have the target vocabulary posted. Inevitably there are new words to add, I write these in their personal fold-out dictionary at the back of their journal. We do this for a few minutes so that I've modeled some sentences. Early on in K or 1 if students are still simply labeling I ask about their drawings, say the French words of a few items, write the words beside their picture and then have them write the word again themselves. We work on the routine of having student read their entry to one another and then to me. Once this routine is well established (and depending on the self-directed skills of the group at work on writing!) I move over to the read to someone station and listen to children read, making notes and intervening where needed. 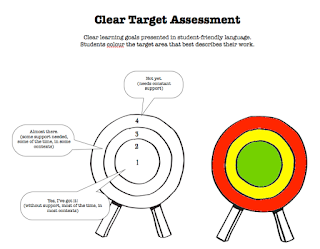 I use this clear target assessment tool (blank ones are also in this file) to have a look at the students writing and to review with them where they are struggling in writing (beginning, middle end is for grade 3). 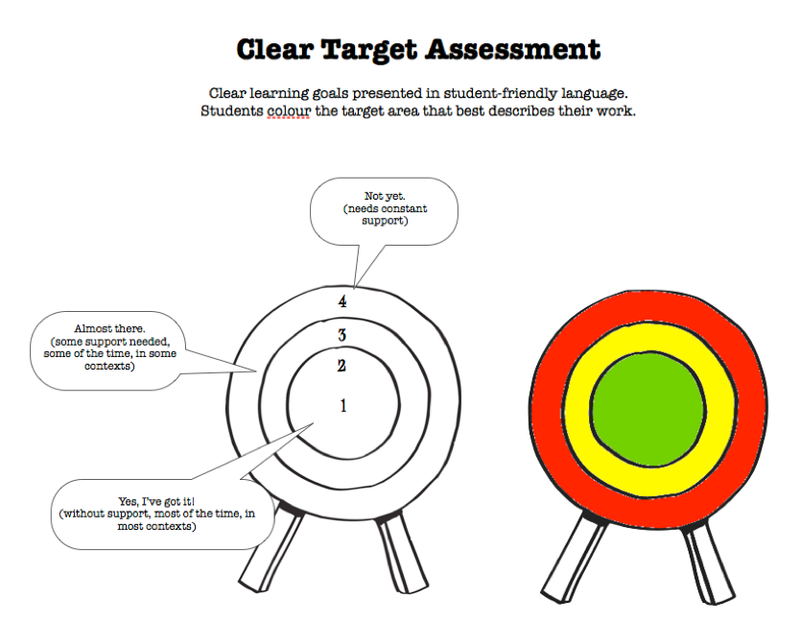 For overall writing assessment however I use the reading and writing (and speaking continuums posted here). Parents get a copy each term, sign it and return it. A highlighted copy stays in the child's file and a copy is sent home for parents and student. Using words from around the room, word strips or visual dictionaries students choose from about 4 or 5 ways to practice spelling words (with play dough stampers, stamps, magnetic letters, clothes pins). An example of these activities are here. I made kits for teachers in grade 1 and K, the students really love them. There is some teaching that needs to go into how to use them, how to put them away properly and how to care for all the parts. We have learning buddies and are paired with student once a week from grade 1 or 2. We write collaborative books every month. Students all do the same page of a book but add their own words. We practice 'reading' the sentence and then read to our buddies. Students also keep a book box of songs and finish-me books that go with our theme. They sing or read these books to their buddy. In Sept.-Dec. yes, the students have memorized the words but we still have them "read", track the words with their finger and practice fluency. From January-June students begin to be able to read simple books and many are at different levels. For more about what kinds of books we begin with in kindergarten please see the post on this blog here. Bonjour Madame Kenny! Your comment made me reflect more about what I do, you're right that an oral development component is something key to a second language classroom. 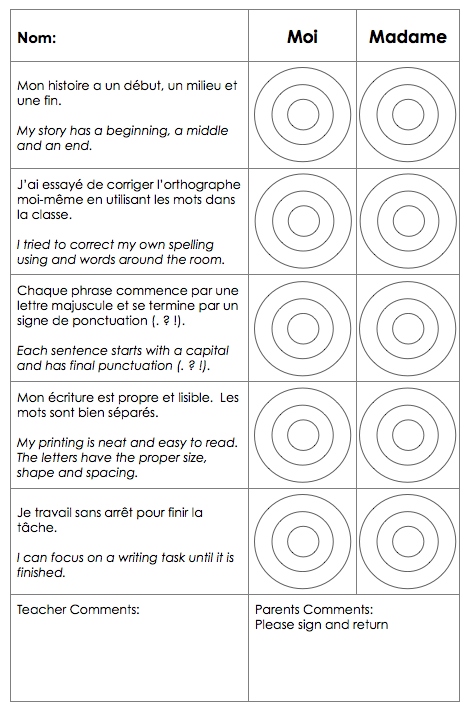 I did add an update about how I scaffold the "work on writing" station. Thank you for your supportive comments! 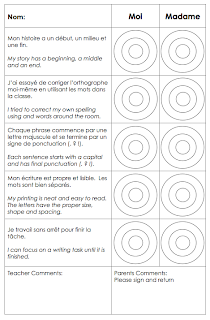 I am a grade 1 french immersion teacher in Ontario. I have modified the Daily 5 by combining Read to Self and Read with a Partner and adding Oral (they have choices between role play, dramatizing a story, puppets, games such as Guess Who, etc.). I think the other way that the oral component is evident in the Daily 5 is by making it an explicit expectation when you are introducing the Daily 5 (eg. "When I am talking about what I am reading and writing I speak in French"). It is also reinforced when you dicuss the learning that has taken place in whole group and during small group work and individual conferencing. Megan that sounds like a great idea in a second language classroom. If you're on twitter that's a great question to ask to the #daily5 or #d5chat or even #frimm hashtags. Thanks for your input! Bonne journée! Thank you so much for this incredible blog! You have helped me tremendously! That's so great to hear Charla! Thanks for taking a minute to leave such a nice comment! I am late replying as I turned off comments to avoid a ton of spam that was appearing in my comment fields.